12 pairs of ribs (along with their associated costal cartilages) and the sternum. ​The function of the thoracic cage is to support and protect the vital organs of the thorax. The rib cage of most humans contains 12 total pairs of ribs. The ribs are numbered beginning with the 1st ribs being the superior-most pair of ribs., and proceeding inferiorly, with the 12th pair of ribs being the most inferior ribs. The ribs are categories according to how they articulate with the sternum through the costal cartilage. 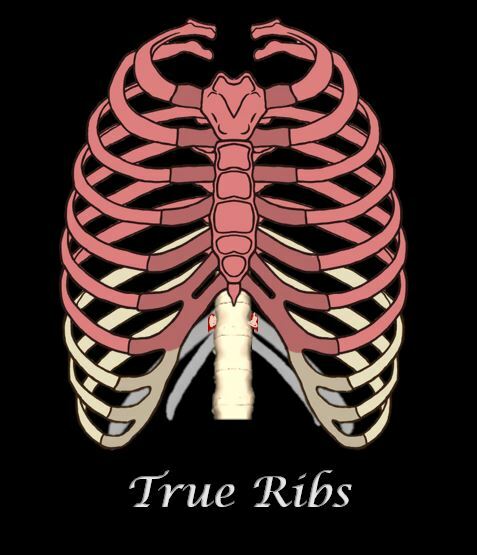 True Ribs - The first 7 pairs of ribs are called the "true ribs", because they articulate directly to the sternum through costal cartilage. 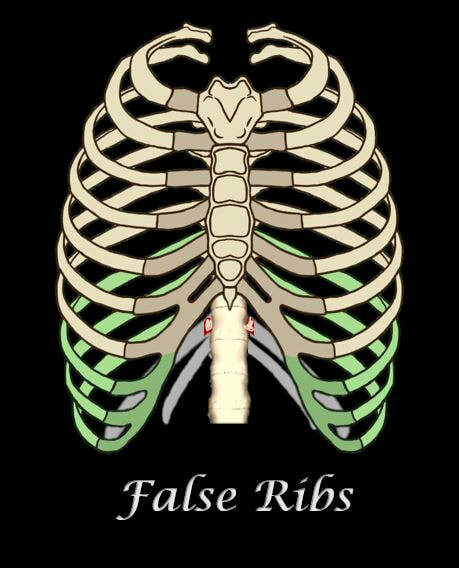 False Ribs - The false ribs are the 8th, 9th, and 10th pairs of ribs. 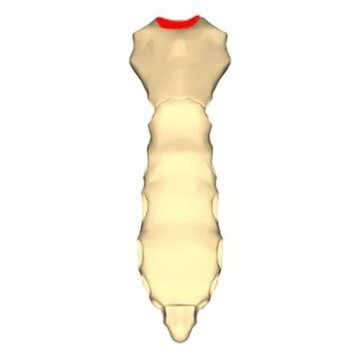 These do not directly connect to the sternum, but they attach to the 7th pair of ribs. 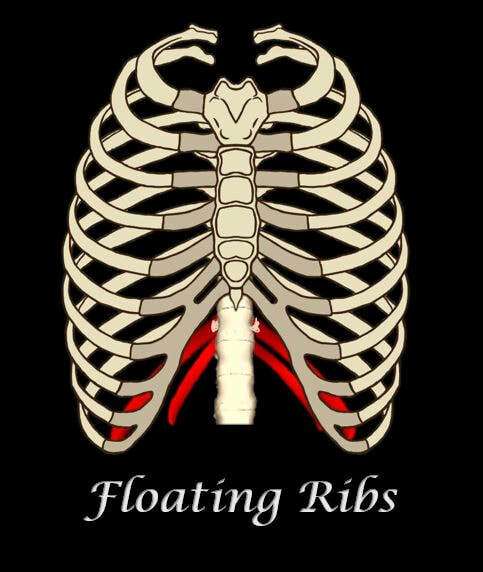 ​Floating Ribs - Are the 11th and 12th pairs of ribs that do not articulate with the sternum. 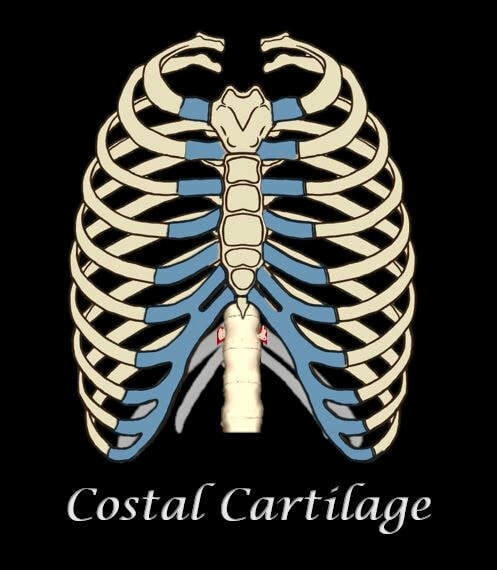 The ribs are connected to the sternum through the costal cartilage. 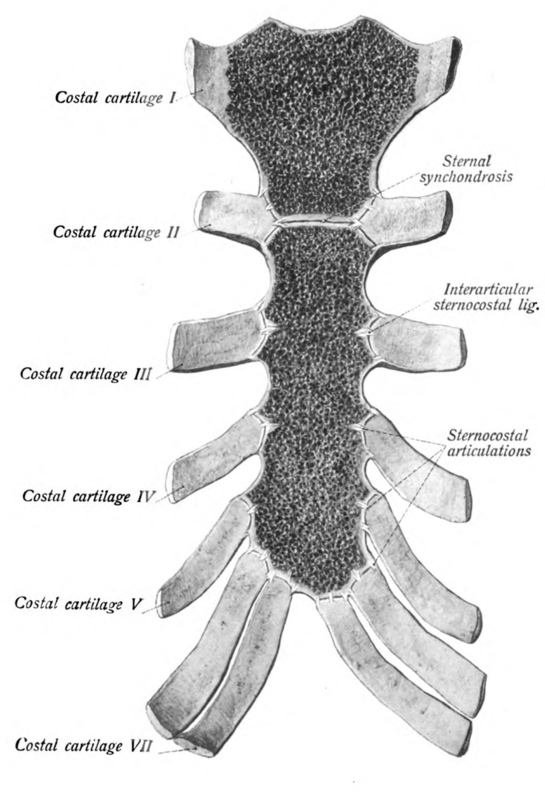 There are 7 sections of costal cartilage on each side for the superior 7 ribs. Unlike the "true ribs" which articulate directly to the sternum through the costal cartilage. the "false ribs" do not articulate directly to the sternum through costal cartilage. Instead, the "false ribs" connect to the 7th ribs through cartilage. The false ribs are the 8th, 9th, and 10th pairs of ribs. The 11th and 12th pairs of ribs are called "floating ribs". 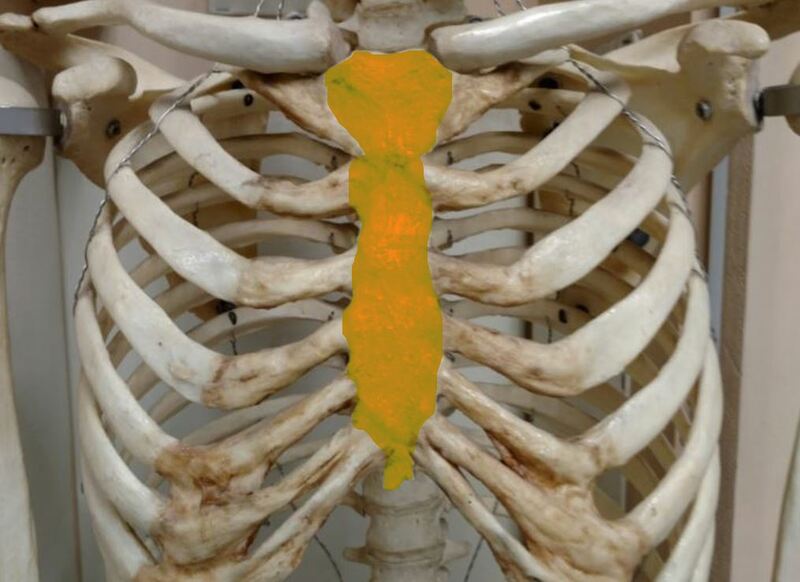 These floating ribs do not articulate with the sternum and are only about half the size of the other ribs. 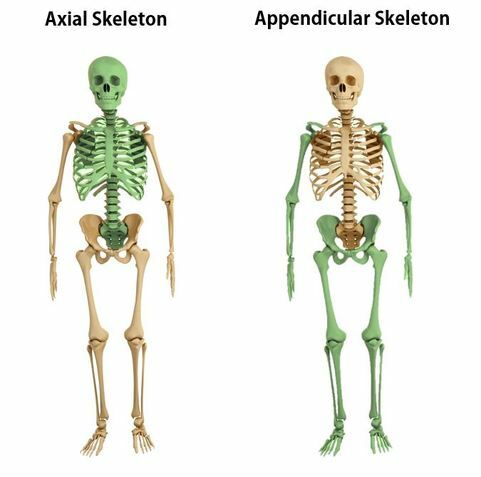 Also, the floating ribs do not wrap around to the anterior portion of the body like the other ribs do. The floating ribs do articulate with the vertebrae. 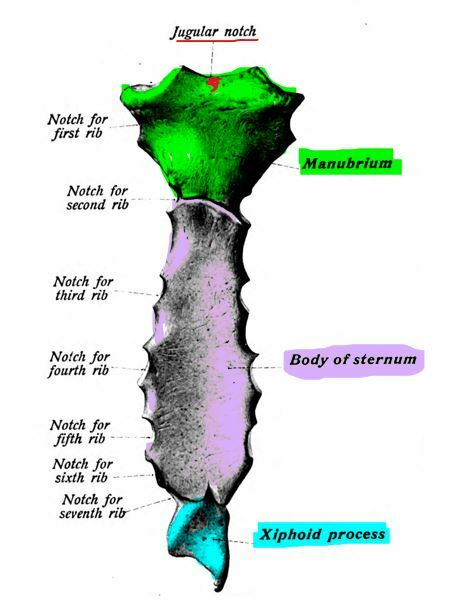 The sternum articulates with the superior 7 ribs through the costal cartilage. 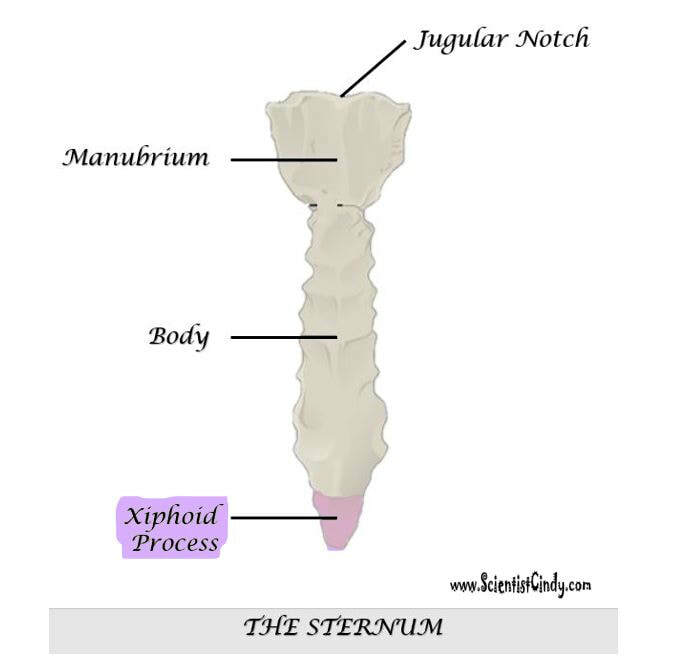 The manubrium part of the sternum articulates with the 1st rib, the clavicles (collar bones). 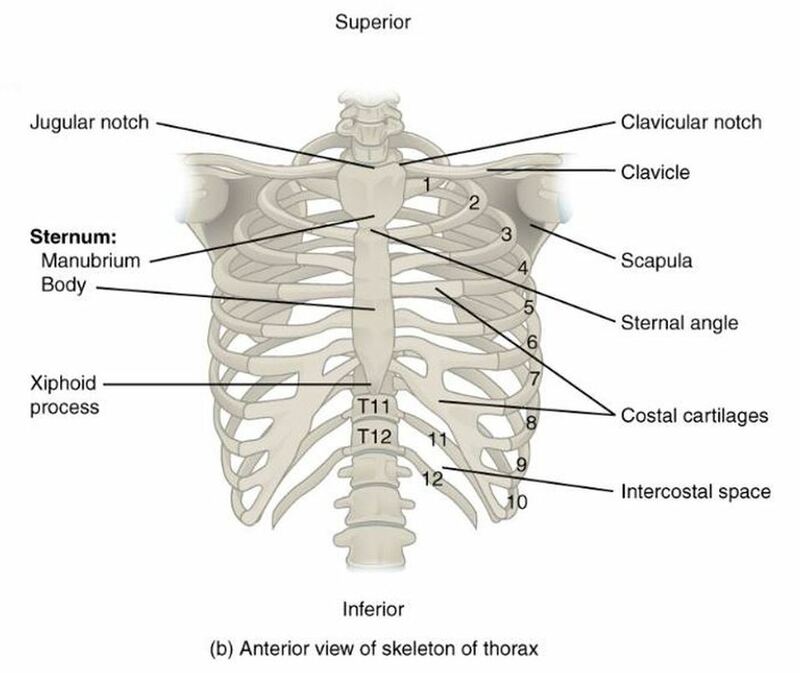 The manubrium has an indentation at the superior end called the jugular notch (also called the suprasternal notch) which lies over the trachea (windpipe). The Jugular Notch is a vulnerable spot that if struck directly with a finger strike (such as that used in martial arts, known as “two-finger strike”). This technique jams the windpipe and can lead to unconsciousness or choking. 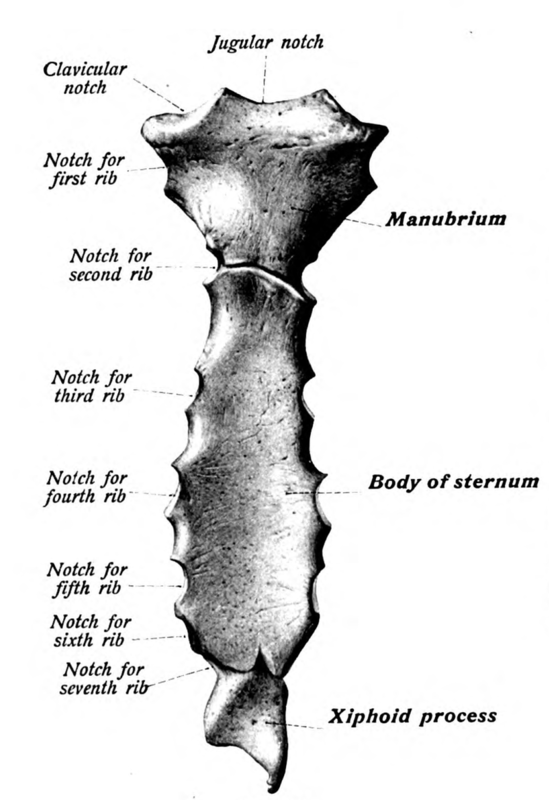 The Manubrium of the Sternum articulates with clavicles and a rib. 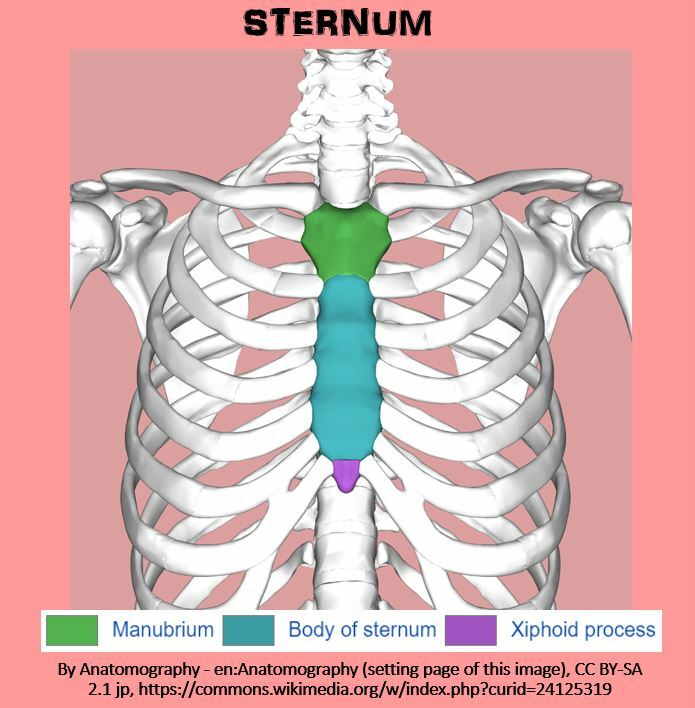 The body of the sternum is the largest part of the sternum. The body of the sternum articulates with the 2nd, 3rd, 4th, 5th and 6th ribs through the costal cartilage. The xiphoid process covers the solar plexus which is a bundle of nerves. 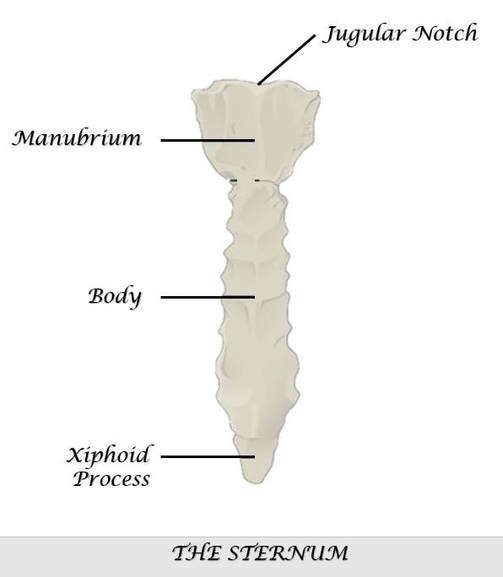 The xiphoid process is at significant risk of being broken off during CPR chest compressions or other similar force. When the xiphoid process breaks off, the diaphragm or liver can be cut leading to internal bleeding.